The federal and P.E.I. governments are investing another $2 million to assist the P.E.I. potato industry in its efforts to prevent tampered potatoes from making it to market. 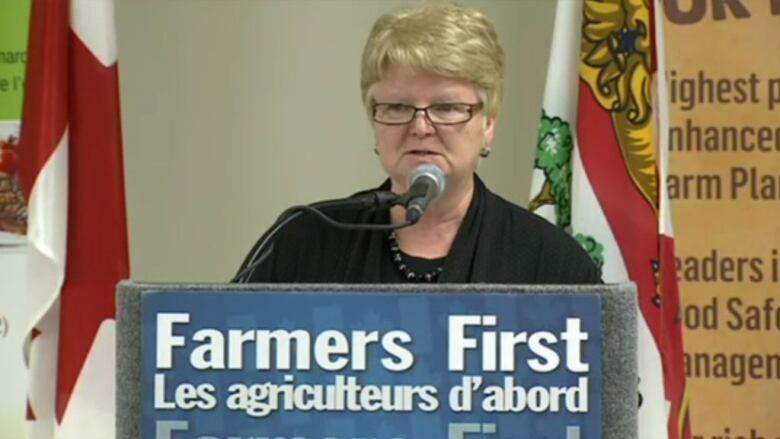 Gail Shea, P.E.I. 's representative in the federal cabinet, announced Ottawa's $1.5-million Monday morning at the P.E.I. Potato Board office in Charlottetown. The money will go to metal detection technology, both on farms and at potato processing plants. The industry has been dealing with a number of cases of metal objects being inserted into potatoes. There have been metal objects found in potatoes in all four Atlantic provinces. "Everyone's goal in to maintain consumer confidence in our world class potato product," said Shea. Shea noted that endangering public safety in this way is a criminal act. "To most of us it would seem unimaginable that an individual or group would resort to such an evil activity that could not only jeopardize the livelihood of our hard-working potato farmers but also put Canadian families in harm's way," she said. As Shea was making her announcement, the provincial government sent out a news release announcing another $500,000. The provincial funding will be used for such work as on-site security assessments, training, equipment and continued strong compliance with food safety requirements associated with the detection of foreign material. The incidents began last fall. Most of those cases were tracked back to a single farm. There were more cases this spring, and it is not clear if they are related. Alex Docherty, chair of the P.E.I. Potato Board, said the money would be put to good use. "We really requested funding from both levels of the government because there's no farmer that has it in their budget to do this," said Docherty. Docherty says the industry has been in shock since problems began in late 2014. RCMP continue to investigate but there have been no arrests. "Food tampering is a serious criminal action, it's terrorism at its finest, doing something that can cause harm to a human being, it's mind blowing," Docherty said. "We've been actively involved with research into the best detection equipment available for the foreign material." The announcements Monday are in addition to $1.4 million made available earlier this month through the Growing Forward 2 program, which is jointly funded by the province and the federal government. Shea said the federal government has been watching the situation closely, and that Canada's reputation for quality food must never be taken for granted. The P.E.I. potato industry is offering a reward of up to $100,000 for information leading to the conviction of anyone involved in the potato tampering incidents.